An Installation view of "A Nkisi for Jeffrey Cook" at Boyd | Satellite Gallery, New Orleans. If you drew together the various threads of the New Orleans art scene over the past 40 years, many of them would converge on the life and career of Jeffrey Cook. Born in Central City in 1961, Cook attended McDonogh No. 35 Senior High School and studied at Xavier University with artists John T. Scott and Martin Payton before moving to California and starting a successful career as a professional dancer. When he moved back to New Orleans in the mid-1980s, Cook returned to the visual arts and began creating the fantastic assemblages which would become his signature over the next several decades until his untimely death in 2009 — and which are now the subject of a powerful new exhibition at Boyd | Satellite on Julia Street. In addition to its spectacular visuals, the show is equally strong in conveying how much Cook — described as “a nurturer, a giver, a seer and protector of knowledge” — was revered by his fellow New Orleans artists and others in the New Orleans art community. Curated by three of Cook’s closest friends and artistic associates, the show has an intimate feeling that both preserves the memory of one of the most important and prolific New Orleans artists of his generation and introduces it to a new audience. Contributions by gallerist Andy Antippas and artist Ron Bechet complement the thoughtful installation by Blake Boyd, and the result is both an affectionate tribute and a moving retrospective. The exhibition shows how Cook moved from early box-shaped assemblages which read like distressed Joseph Cornell pieces — complete with stamps, photographs and other objects culled from Cook’s international travels as a dancer — to ones which incorporate more of the African- and African-American-inflected motifs which would become a central part of his mature style. A closer look reveals Cook’s eclectic use of materials and objects which reappear throughout his work: nails, strips of bandanna fabric, pieces of chalk, brooms, alphabet blocks, doll parts and gun stocks. Like Jasper Johns and Robert Rauschenberg before him, Cook was a master of combining disparate objects into charged assemblages that became more than just the sum of their parts. Many pieces contain wrapped bundles resembling gris-gris bags, into which Cook was known to include notes and other objects. It’s art that is literally full of secrets. Other pieces in the show are recognizably human in form — sometimes disturbingly so, like a pair of figures composed of pieces of rags and bound with nooselike pieces of rope. One slumps over as if resigned to its fate. On one wall, Cook’s objects are displayed with a selection of African nkisi figures which Cook was known to have been inspired by. His own take on these ritualistic objects fuse commanding formal presence with a powerful spiritual dimension. Many seem to almost breathe and pulse with hidden power. Nearby, two of his collages of African sculptures superimposed on portraits of African-American sharecroppers make explicit one of the major throughlines in Cook’s work: the influence, spirit and material presence of traditional African forms and energies. 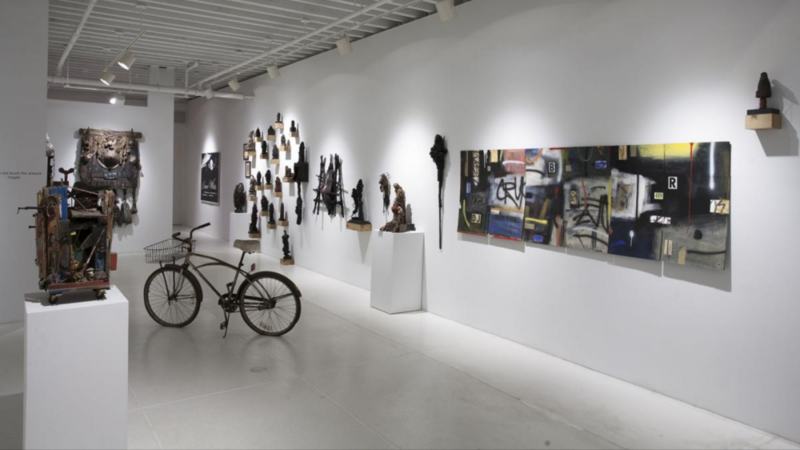 Objects from the artist’s personal collection, like a rusted bicycle he salvaged after Hurricane Katrina, are also included in the show and give the installation an additional layer of Cook’s presence, as do portraits of Cook by Blake Boyd and Renee Stout. Coincidentally, another portrait of Cook by George Dureau is currently on view in the “Mapplethorpe and Dureau” show at the Arthur Roger Gallery next door. In Dureau’s composition, Cook’s finely hewn body is arranged geometrically, almost like a component in one of his assemblages. It’s another tribute to one great New Orleans artist from another, and a serendipitous adjunct to a splendid exhibition which reveals Cook’s work to be more vital than ever.